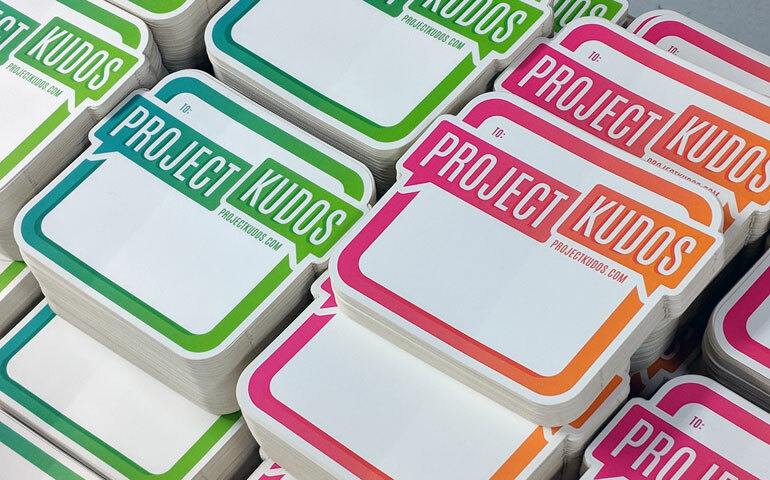 Today's theme is Appreciation, and our friends at Schell Brothers are stepping up the game with Project Kudos stickers printed on our matte die cut sticker product. Schell Brothers is a builder of high-end homes that's also building a culture of positivity through this project, and since we have a culture of appreciation at StickerGiant during our company meetings this sticker really spoke to us. Project Kudos is about more than just spreading the love within their own company. Their hope is that everyone will join them in spreading that same positivity and love to the people in their own lives. They challenge us to give kudos - today and everyday - to the deserving friends, family, co-workers, and even mere acquaintances that we are grateful for. Project Kudos is about telling someone they’re amazing, and feeling awesome about it. It’s about positivity, good vibes, and acknowledging all that shines around us. They feel that we have so many different people, places, and things to be grateful for, but sometimes we forget to show it. They might be right. Schell Brothers challenges us all to hop on this crazy ride with them and help make someone’s day a little brighter. Give a kudos to someone who deserves it. Let someone know they are awesome. Be a positive force by talking with the Project Kudos team, and put a kudos sticker on the bus, get some great kudos swag, and help them spread positivity and good vibes. Yes, they have a bus covered in Project Kudos stickers, which you have to see on their website. The foundation of Schell Brothers is their culture of happiness, but it’s not built overnight, which is why giving kudos is so important to their team. By giving kudos to one another at company meetings, and throughout the work day, they create an environment full of positivity, gratitude, and happiness. They want their coworkers not only feel appreciated, but to feel like family. As they watched the positive effects of giving kudos manifest themselves amongst their team at Schell Brothers, they thought, "Why not create a movement? Why not take our good vibes and spread them to other companies and individuals? In a world with so much negativity festering, we want to throw out as much positivity as we can muster and watch it grow." We love that mission that they've created, and we're so thankful that they printed these stickers with us that are going out into the world to spread good.